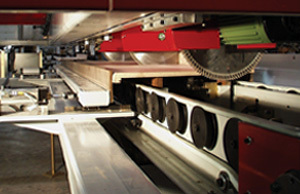 Automated Crosscut Saws for the Wood and Related Industries – Creative Automation, Inc.
Creative Automation provides purpose-built automated crosscut solutions for virtually any industry. This custom designed crosscut saw is part of a moulder/profile wrapping line. 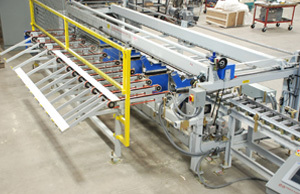 Primary features include: multiple saws setup to position automatically, and end trim scrap handling. Kitchen countertop crosscut saw. Blades setup automatically based on barcodes.